When I watched the HBO documentary about Helen Thomas, "Thank You Mr. President," I remember being impressed about what a long, successful career this woman had. But that entire career was soured this past summer when her true colors were displayed. David Nesenoff, a Conservative rabbi, filmed Helen Thomas outside the White House saying that Jews should "get the hell out of Palestine." The 90-year-old Lebanese news correspondent was promptly fired by Hearst Communications. 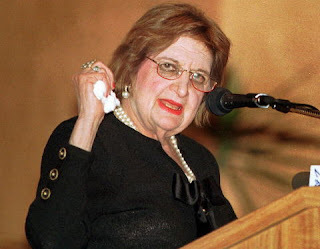 Last week, at a speech to an Arab-American group in Dearborn, Michigan, Helen Thomas uttered more anti-Zionist and anti-Semitic statements. She said, "Congress, the White House and Hollywood, Wall Street, are owned by the Zionists. No question in my opinion. They put their money where their mouth is... We’re being pushed into a wrong direction in every way." While Detroit's Wayne State University, from where Thomas graduated in 1942, chose to maintain its Helen Thomas Spirit of Diversity in the Media Award following her outrageous remarks this summer, her most recent comments forced the university to act. Wayne State announced on December 3rd that it would no longer present the award. In a statement, the university said, that it "strongly condemns the anti-Semitic remarks made by Helen Thomas." The Anti-Defamation League issued a short statement saying Thomas "clearly, unequivocally revealed herself as a vulgar anti-Semite." Robert Cohen, executive director of the Jewish Community Relations Council of Metropolitan Detroit was quoted in today's Detroit Free Press. He said, "When she said … that Congress, the White House, Hollywood and Wall Street are owned by Zionists, Ms. Thomas repeated the anti-Semitic stereotypes that have been used for more than a century to incite hatred of Jews. Her comments should be condemned by all people who oppose bigotry in any form." In an interview, Helen Thomas said that she stands by the comments she made to Rabbi Nesenoff outside the White House during a Jewish Heritage Month event. She also criticized U.S. foreign policy in the Middle East and Afghanistan during an interview this past Thursday in Dearborn. She said the Iraq war "was built on all lies." She continued, "Thousands are dead, with no reason explained yet. There has been no truthful reason for going into Iraq." Asked what she thought was the reason for U.S. policies, Thomas replied: "Because they own the ink. They also own the airwaves," adding that she was referring to "Zionists." Detroit Free Press religion editor Niraj Warikoo interviewed Helen Thomas yesterday and asked her about Wayne State University ending the annual diversity award in her name. She told him that "the leaders of Wayne State University have made a mockery of the First Amendment and disgraced their understanding of its inherent freedom of speech and the press." She said "Israel should get the hell out of Palestine". This simple misquote turns her into an anti-Semite when she is herself a Semite. Idiots!